101 Smart Questions to Ask on Your Interview is for every job candidate who thinks the question "Do you have any questions for me?" marks the end of an interview. In Fry's view, it marks the beginning of the last and perhaps most important interview phase, one that's so important that failing to properly prepare for it can undo all the rest of your hard work, including providing great answers to tough questions. It's your moment to shine-to show off the depth and breadth of your research, to remind the interviewer of how perfectly your credentials fit the job description, and to actually ask for the job! Fry shows you how to take charge of the interview process, presenting yourself as the self-managing, versatile, and confident candidate most employers are seeking. He demonstrates how to use the interview process to sell the company on you while obtaining the information necessary to make sure you are sold on them. 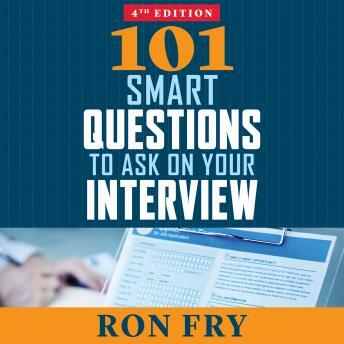 From what to ask, when to ask it, and the kinds of answers to expect, 101 Smart Questions to Ask on Your Interview gives every candidate, from first-timers to seasoned pros, the practical information and advice they need to ace the entire interview...and get their dream job.